Man caves don’t have to be dark basement rooms or unfinished garages. Any room in the house can serve as a sanctuary for dads or bachelors alike, styled with elements of masculine design. The formula for the ultimate man cave rests with the hobbies and interests of the man in question. Whether he wants a media room for watching the game, a quiet office for working on the computer, or just a room without any frills or throw pillows, we can help you with window treatments that add both form and function to your man cave decor. For man caves centered around TVs or computers, blackout shades are a must. Blackout shades will help block light and glare, as well as add a layer of insulation to your windows. For Roman Shades, like the Cascade Roman Shades pictured above, you can choose any material and add a blackout lining free of charge. For complete darkness, consider adding a Cornice above the shades, and even blackout drapery to eliminate any light seepage around the sides of the shades. Whether you like the fullness of Roman Shades or prefer the more minimal design of Roller Shades, we offer plenty of room darkening materials for a wide range of window treatments, including Woven Wood Shades and Cellular Shades. 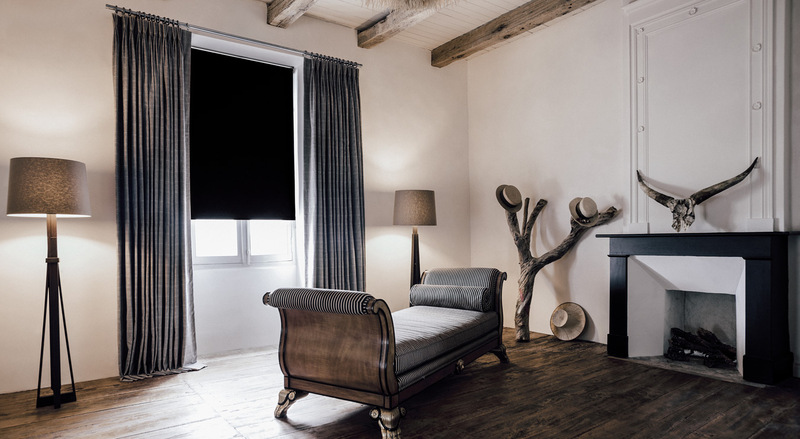 See our full line of blackout window treatments here. 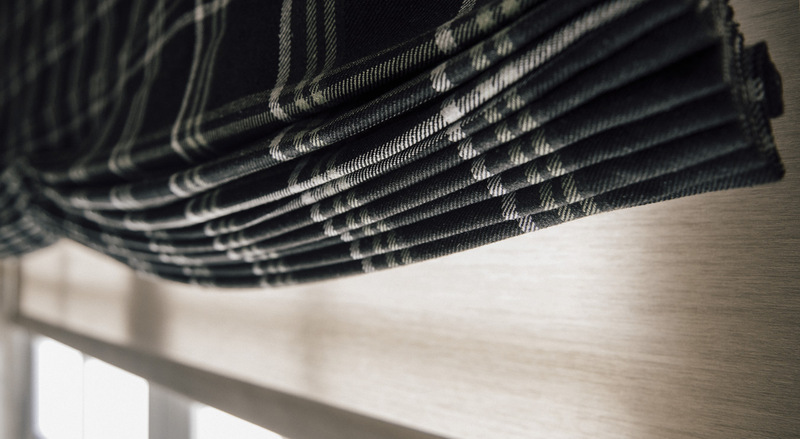 Add a touch of menswear-inspired design to your man cave (or any room) with shades and drapes in a masculine stripe or plaid. 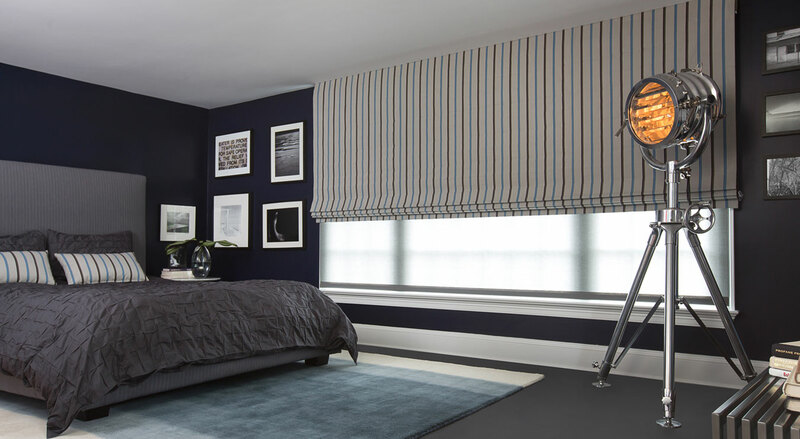 Browse the Stripes + Plaids swatches for Roman Shades and Drapery for stately materials like Suit Stripe, Manor (pictured above), Bleeker (pictured below), and more. If solid colors are more your style, try a Wool Blend or Herringbone fabric for a feel reminiscent of a suit. For a man cave with natural accents or an outdoor theme, add texture with Woven Wood Shades. 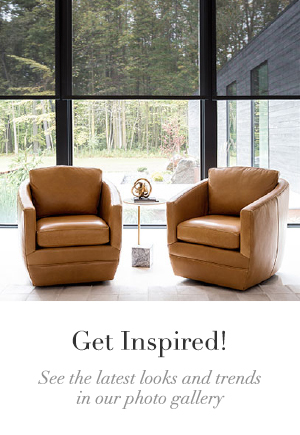 These materials are available in a wide range of colors, from earthy browns to a deep blue, and can also be crafted with decorative borders in an accent color. If you’re in the process of designing a man cave or updating an existing one, new window treatments can help you create just the atmosphere you’re looking for. 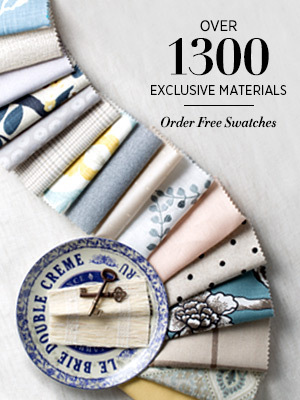 Order as many free swatches as you like to test out colors and materials in your space. 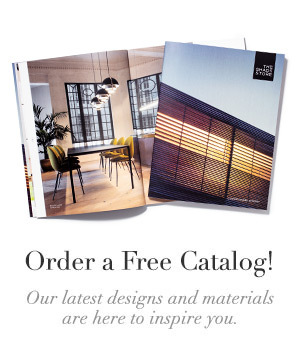 And you can always stop by and see us in one of our nationwide showrooms to see our shades in action.